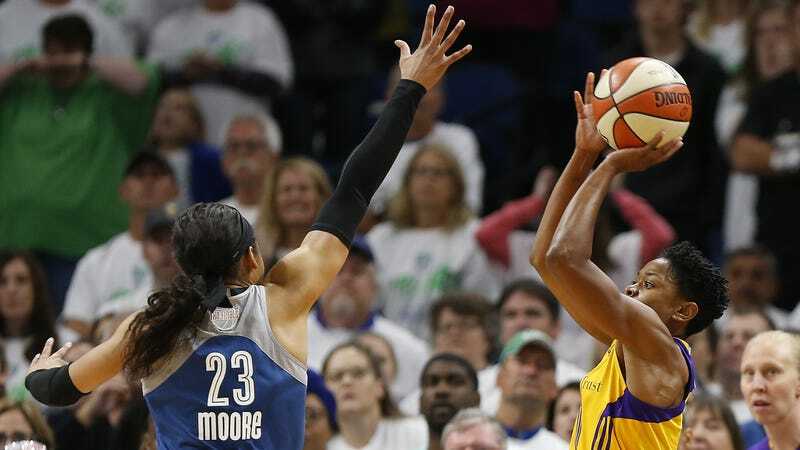 Today’s WNBA Finals Game 1 between the L.A. Sparks and Minnesota Lynx ended with a buzzer-beater from guard Alana Beard to give Los Angeles a 78-76 win and 1-0 lead in the best-of-five series. Minnesota’s Lindsay Whalen, Maya Moore, and Sylvia Fowles each had 18 points, with Moore making a crucial layup to tie the game at 76 with 24.7 seconds left in regulation. But with the clock running out, Beard—mostly known as a defensive asset to the Sparks—lurked in the right corner and nailed the shot to beat the Lynx. The basket was initially ruled as a three but was changed upon replay. This is the Sparks’ first Finals appearance since 2003; Los Angeles won back-to-back Finals in 2001 and 2002 with Lisa Leslie. They aim to beat the Lynx, who are the reigning league champions and have won three of the last five championships. Game 2 is Tuesday at 8 p.m. ET on ESPN2.